Hindutva organisations Bajrang Dal and Vishwa Hindu Parishad have put up posters in Uttar Pradesh’s Bulandshahr district that carry a photograph of local Bajrang Dal leader Yogesh Raj wishing the public on Makar Sankranti and Republic Day. 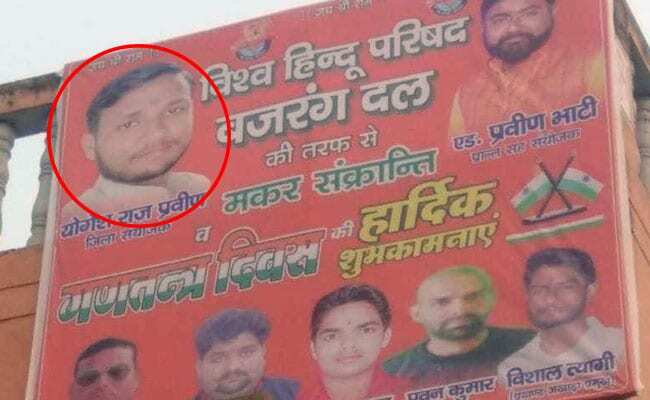 Bulandshahr: Yogesh Raj, the main accused in the December mob violence in Uttar Pradesh’s Bulandshahr in which a police officer was killed, was featured in Bajrang Dal posters across the region. The wishes came on the behalf of Praveen Bhati and Yogesh Raj whose title is mentioned as District coordinator. Defending the move, Bajrang Dal’s Assistant Regional Convenor Praveen Bhati told News18.com, “There is nothing wrong in putting up such posters as Yogesh Raj is the local convenor, and just an accused. He is yet not guilty.” Bhati also features in the poster. “From the day of the riots itself, we have openly admitted that Yogesh Raj is an able worker of the Bajrang Dal and we stand by him. There is a huge difference between someone who is accused and someone who is convicted. The posters display Yogesh’s patriotism which even an accused has a right to express. We completely endorse this”, said Balraj Dungar, State Convenor of Bajrang Dal. The display also has names of Satish Lodi, Ashish Chauhan, Satendra Rajput and Vishal Tyagi- who have been accused of playing a role in the Bulandshahr violence that claimed the life of Inspector Subodh Kumar Singh. “The poster has been put up by Praveen, who is also a worker of the party. We see no wrong in this”, continued Balraj Dungar. The posters were allegedly taken down by the authorities within a day from areas including Nayabans village, of which Yogesh Raj is a resident of. Yogesh Raj was arrested on January 3, exactly a month after Singh was killed in mob frenzy over cow slaughter allegations. The police say he raised the cow slaughter complaint after the discovery of carcasses at a forest and incited a mob that targeted policemen. While absconding, Yogesh and co-accused Shikhar Agarwal had released videos on social media alleging their innocence and changing their statements given to the police and on social media. Yogesh Raj was able to avoid arrest and even put out videos from hiding, which led to allegations that the UP police was soft on him. The perception gained more traction when Chief Minister Yogi Adityanath, at a security review meeting after the mob killing, was seen to be more concerned about taking action against cow slaughter, NDTV reported.